Unfortunately, car accidents are a common occurrence on the Las Vegas roadways. Las Vegas drivers are not known for being the most courteous compared to the rest of the country. And, what’s worse is that they commonly drive without car insurance. In a typical situation, if you are in a car accident, you would have to gather the contact information of the other driver, get their car insurance information and file a claim based on your injuries. The whole process is not exactly easy, but at least you can go on with your life having been properly compensated for the damage that the other driver caused. In situations where you are struck by an uninsured motorist, things can get much more complicated. If you are injured, you are stuck trying to determine how to pay for your injuries from the car accident. If your car is damaged or totaled, you will likely have to file a claim against your own insurance company which could raise your rates. You should always get the police involved as soon as you discover that a driver does not have valid insurance coverage on their car. Don’t let the other driver persuade you not to call the police. Getting a police report will help document the situation and protect your rights. It is not uncommon for a criminal to produce a fake insurance card when you ask for one. So, make sure that you inspect the card well. Make sure that the card has a current date on it and that it looks legitimate. If you are afraid that the card is not legitimate, you can call their insurance company on the spot to verify that it is actually valid. So many individuals get scammed by a driver who just takes off after the accident without producing a valid insurance policy. If you do find that the policy is not valid, again, call the police right away. Speaking with an experienced personal injury lawyer in Las Vegas will make a huge difference in your case if you were hit by an uninsured motorist. A great personal injury lawyer will fight to get you the compensation you need when someone was driving without valid insurance. They have the ability to go after the individual’s personal assets and even a corporate insurance policy. Lawyers do this on a regular basis and speaking with a lawyer you trust could completely turn the situation around. You also have the opportunity to protect yourself by purchasing additional insurance coverage for you and your family called Uninsured Motorist Coverage (UM) and Underinsured Motorist Coverage (UIM). (See Article: Not Being Compensated with Full Coverage) For obvious reasons, motorists who do not have current insurance on their vehicle do not typically have assets that you can go after. For this reason, insurance companies have created policies that you can purchase to be used when you are hit by someone who is not insured. Uninsured Motorist and Underinsured Motorist Coverage is an add-on to your current policy that you have the option to purchase. Most would tell you that opting in is generally a good idea given the fact that so many drivers only have the minimum insurance coverage, if any coverage at all. If you can afford to make the extra payment, you will not regret it if you are ever hit by an uninsured driver. 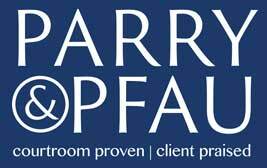 If you are the victim of an accident with an uninsured driver and you want to learn more about your ability to get proper compensation for your injuries, the expert lawyers at Parry & Pfau are ready and willing to assist you. Call 702-879-9555 or click here to request your free consultation with one of our lawyers today. Older PostHow Long Should I Wait to Hire a Lawyer for an Injury?